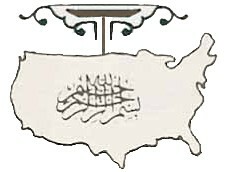 The Arabic written across the United States is the basmalah, usually translated into English as "In the Name of God, the Merciful, the Compassionate." This Koranic invocation, the authoritative Encyclopaedia of Islam (vol. 1, p. 1084) informs us, "at the beginning of every important act, calls down the divine blessing on this act and consecrates it." It also bears noting that "The American Muslim" website portrays itself as "providing a balanced, moderate, alternative voice focusing on the spiritual, dimension of Islam rather than the more often heard voice of extreme political Islamism." Sounds great, yet this website includes precisely such voices of "extreme political Islamism" in the form of Yahiya Emerick and Ibrahim Hooper. In keeping with the above graphic, Emerick is author of an essay titled "How to Make America an Islamic Nation" and Hooper has stated "I wouldn't want to create the impression that I wouldn't like the government of the United States to be Islamic sometime in the future." Pipes betrays his own projections in the way he reads an innocuous image showing the Muslim presence in America as an explicit statement of intent by the Muslims to take over the USA and replace the Constitution. The irrational scope of this distortion and the vehemence with which it is uttered are themselves evidence of Pipes' primitive mental processes. What anyone with a modicum of psychological understanding reads from that is that Pipes himself harbours an intent to promote the take-over bid of which he accuses the Muslims. Note that Henzell-Thomas makes no attempt to refute my arguments but merely blusters and accuses. In miniscule, this is the totalitarian mind at work. Fascists and communists would feel right at home. Feb. 4, 2004 update: My little Jan. 31 update above (150 words) prompted lengthy responses from Sheila Musaji (3,300 words) and Jeremy Henzell-Thomas (1,100 words). But although my two respondents range over diverse topics (a history of "The American Muslim," a family history going back to the sixteenth century), nowhere do they address the specific evidence of intention that I cite in the original posting, especially the public statements by Yahiya Emerick and Ibrahim Hooper, both listed on the homepage of "The American Muslim" as contributing editors, of hope to make the United States an Islamic country. These statements are hard facts which heaps of words will not make go away. It would seem after reading more of the text of the original article that Ibrahim Hooper's as well as Yahiya Emerick's comments refer only to the wishful thinking of a member of a particular religious group that – some day everyone will come to accept their own religious beliefs. Anyone who is deeply committed to a religious belief system would probably admit that deep down - if they "had their druthers" they would wish that others would come to share their beliefs. If I believe that I have something worthwhile I want to share it with others. This does not necessarily mean that they plan to impose those beliefs. Musaji is entitled to her benign interpretation that Emerick and Hooper are engaged in nothing more than "wishful thinking," while I am equally entitled to see in their statements reflections of the Islamist project's programmatic intent. The American public will have plenty of opportunity to decide which of these outlooks is more on the mark. July 9, 2004 update: "The American Muslim" unveiled a revised website today, in which the graphic that started this discussion is modified and diminished in size. July 12, 2004 update: In a deeply eccentric memoir posted today, Robert D. Crane (about whom I have written before, notably in a blog titled "Being Ascribed Views I Do Not Hold") recounts the "first North American Muslim Pow-Wow" that took place in 1993. En passant, Crane refers to the "growth of Islam in America as a source of wisdom to help Americans revive the best of America's heritage" and characterizes the event as "a spiritual and an intellectual jihad."